Google’s Search plus your world is finally being rolled out and the integration with Google+ reveals why we can finally stop comparing it with Facebook. Social Search integrates the power of web searches AND your personal social networking circles to bring ever more relevant results. It also illustrates how Google+ isn’t just a Facebook clone, but something deeply integrated into Google’s core business model: search. Google’s latest rollout (if you don’t see it yet you will soon) introduces three new features: Personal Results, Profiles in Search, and People and Pages. Together, these features combine to create Search plus Your World. Search plus your world integrates personalized search results with standard search results. When in personal mode you’ll see your content as well as content shared with you on Google+, even if it’s not a public post. This includes photos, Google+ posts and shared links. Personal mode doesn’t eliminate the normal web search results but rather augments the existing results with social results relevant to you. What’s really slick is that Google isn’t forcing personal results down our throats (a clever move). Whenever you perform a query at the top of the page where you usually see the number of search results, you’ll now see the number of personal results as well as the overall global results. You then have a toggle across the top of the page allow you to view only the personalized results, or the global results. This simple toggle means you can get results fine tuned to your profile as well as results from across the web with the toggle of a button. Search plus your world reveals Google+ strategy? Since it’s inception Google+ has been claimed to be a Facebook clone, or a Facebook killer, depending on who you talked to. One Google employee decried it a “pathetic afterthought”. The unveiling of search plus your world shows that Google has had a plan all along, Google+ is a part of that plan, and the plan has always been about one thing: search. When asked if Google+ would replace blogging I tried to outline that unlike Facebook, Google isn’t concerned with being THE central hub that you visit. While it may appear they’re attempting to clone Facebook in a social arms race that’s not really the case. Google had held to their mission statement “to organize the world‘s information and make it universally accessible and useful.” Their business model is targeted advertising, this is accomplished when you search. Google+ is just one more way to do that. Clearly, this is how Google+ fits into Search plus you world and shows how Google envisions social networking integrating into their business model. Unlike Facebook, who holds user data in a walled garden, Google wants it all out there… so they can index it, make it searchable, and target ads towards your results. Google+ profiles will begin displaying inSearch plus your world results right along side content from around the web. The net benefit to the end user is that Google+ profiles they have within their circles will be easy to identify against someone else with the same name. An important thing to note is that while Google+ profile results display, they are NOT limited to Google+ content! The profile link will take you to the persons Google+ profile, but the snippet displayed shows the most relevant content for that person regardless of it being on Google+ or not. An important thing to note here is that by adding social content to your Google+ profile you can get additional content to display in Google search results. Ah… so while it’s not all about content from Google+, Google+ profiles are how you identify what is your content. If you want your blog, Twitter feed, Tublr, or whatever to be highlighted in Google searches for you then you better add them to your Google+ profile! Search plus your world also begin the rollout of People and Pages information in your search results. According to Google, “Starting today, if you search for a topic like [music] or [baseball], you might see prominent people who frequently discuss this topic on Google+ appearing on the right-hand side of the results page. You can connect with them on Google+, strike up meaningful conversations and discover entire communities in a way that simply wasn’t possible before. 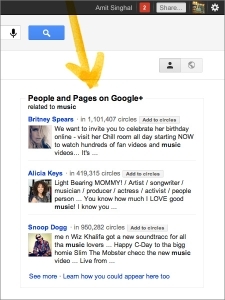 ” Google’s example of how this works is a search for “music,” which displays the Google+ pages for Britney Spears, Alicia Keys and Snoop Dogg in the right sidebar. Ok so this can bring back relevant information for a person or brand I may want to follow. The natural assumption here is that these will also be paid results. Again, we see how Google+ is folding into Google’s primary goal: search. It’s always been search, but now Google is providing brands not only a way to show you an ‘ad’, but that ad takes you to a Google+ profile/brand page where the content producers can interact with you. Google claims to have set a high bar for Search plus Your World. “Since some of the information you’ll now find in search results, including Google+ posts and private photos, is already secured by SSL encryption on Google+, we have decided that the results page should also have the same level of security and privacy protection.” Basically, Google is implementing SSL on all searches for any user who is signed in to a Google profile. Oh… did I mention that all Google profiles have automatically become Google+ profiles? Integration baby. After the privacy disaster of Buzz, Google is taking extra steps with careful UI choices on Search plus Your World. The new toggle on the upper right of the results page makes it simple to view your personalized results, or flip back to see an unpersonalized view of search results. In simplest terms it indicates the difference in their business models. Facebook is a social networking site. Google is a search engine and ad company. Google+ is simply an extension to their core business model of indexing the worlds data and providing relevant results (all why targeting advertising at you). Facebook of course makes its bread and butter off knowing as much about you as possible, and clearly Google needed an inroad into that type of data… hence Google+. However, Google+ isn’t the only thing Google does. YouTube, Blogger, Google Docs, Google Reader, etc… Google+ is the glue pulling all that together. Your social profile across all Google properties now have a singular home… Google+. Google+ however is not in the social networking business, they’re in the data business and Google+ is a method of joining all your different web interactions together. With the release of Search plus Your World we’re beginning to see how all if it ties together… and how it’s all related to the one thing Google has always been good at: search.